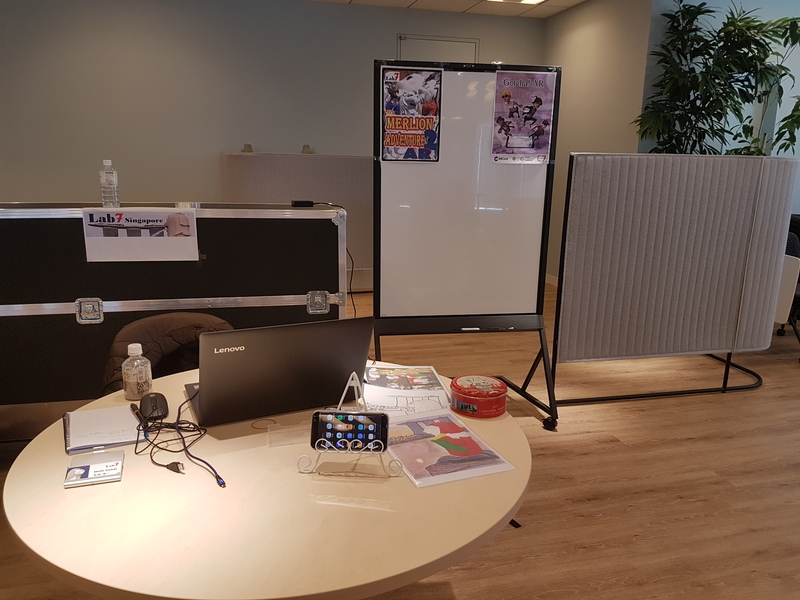 On February 17 (Sun), I exhibited two my AR games at an event called ‘xR Tech Tokyo #14‘, which was held at the office of Mercari, Inc. in Tokyo. 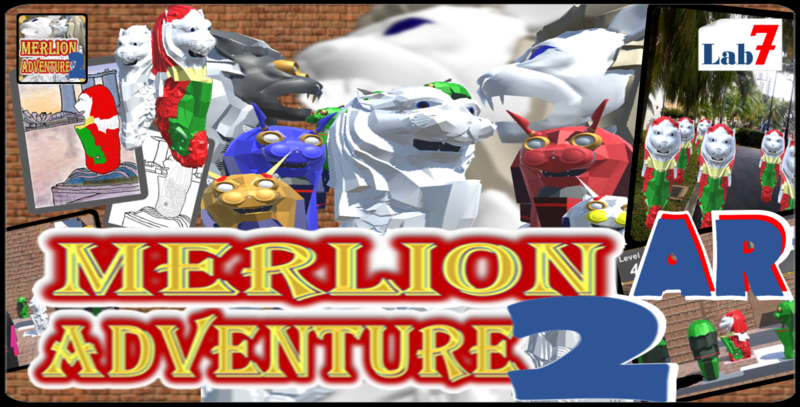 The games ‘Merlion Adventure 2 AR‘ and ‘Gotcha! AR‘, which were also exhibited in ‘Taipei Game Show‘ at the end of last month. It was held at the time when I went to Japan on a business trip of my main job. Even the registration period for participation was over, but I asked directly to the Administrator of the event. This time, luckily the exhibitor space was still opened and I was able to participate. 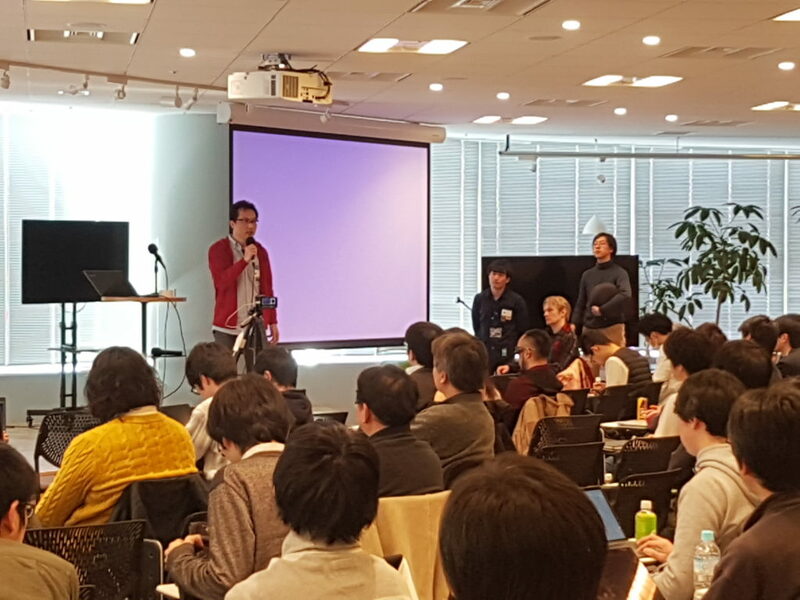 I wanted to build a network with Japanese people related to VR/AR industry, so it was a really meaningful event for me. I really appreciated the administrator who had heard of my request. Thank you very much. This event called ‘xR Tech Tokyo‘ is an event that has been held approximately every other month since 2016 for people related VR/AR/MR industry. 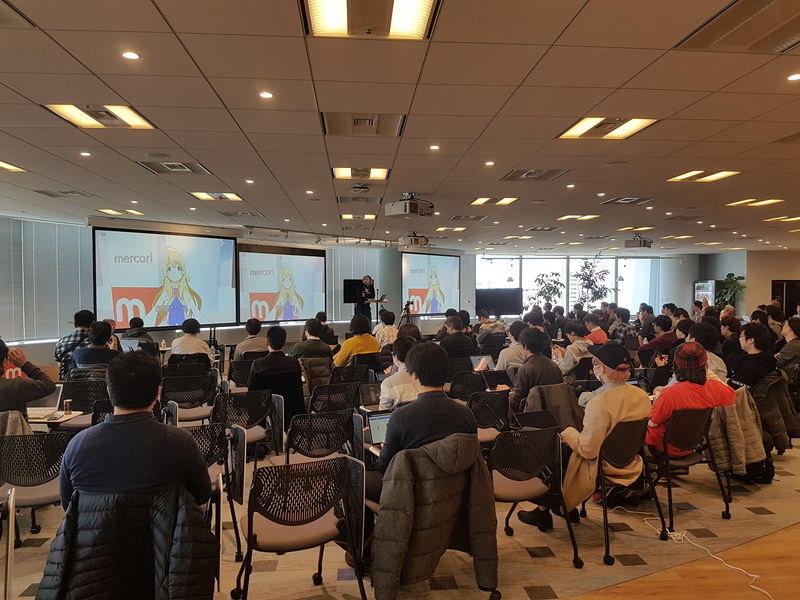 Several sessions about VR/AR/MR technologies, research and product announcements are held firstly, and later, gathering party is held with trying some VR/AR/MR products exhibited there. I’m not sure the other times may be different, but this time, 100 participants (cost: 1000 yen), 10 exhibitors, 30 students, 2 bloggers, 5 volunteer staffs (free) were joined. There were also about 10 speakers. The total number of people was nearly 150. It was great to gather with so much VR/AR/MR people. I was impressed. 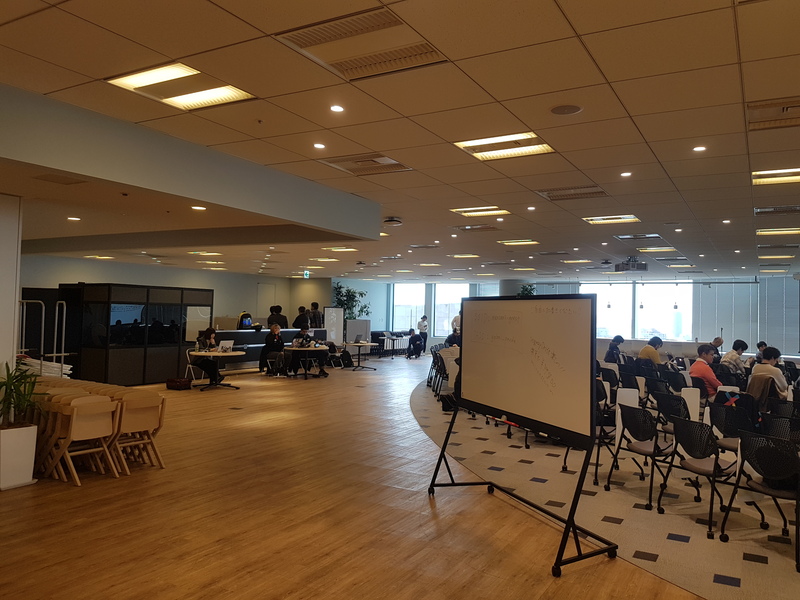 It was the first time to attend a study group on this scale related to VR/AR, so I was impressed by the passionate people for VR/AR. I thought it was very hot place. I’ve ever seen many people who are passionate about games at game events many times, but related VR/AR, I finally could meet them. There were several 30-minute sessions and 15-minute short talks, and they were all interesting. I would like to introduce later in this blog about the session that I was particularly interested in. In addition, I thought the venue is also very good place. It is the office of Mercari, Inc. which is a big e-commerce company in Tokyo. Drinks were totally free, and speakers and exhibitors were also prepared for lunch. In my case, I started game development after moved to Singapore, and I am now shifting to AR development. As a result, I have many friends of game developers in Singapore, and my friends of game developers in Japan have been gradually increasing. 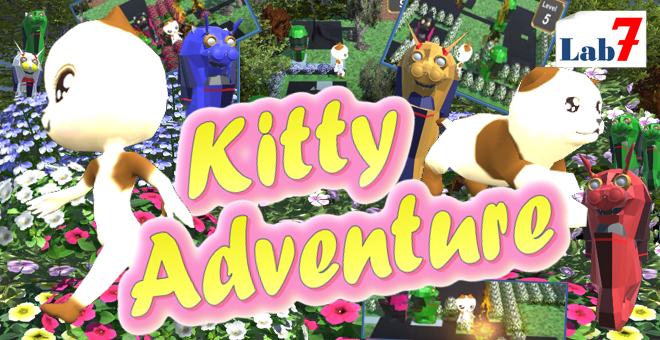 However, as for VR/AR, although I have some friends related VR games, I did not have any acquaintances with AR yet. Under the situation, it was the best opportunity for me in the event that I got many friends working in AR industry. Also, regarding my AR game. At ‘Taipei Game Show’ which I participated in last month, I got high marks from people related game industry and gamers for the AR function part of my game. However, I was worried about how those people in AR industry feel. I exhibited these two AR games and explained to a lot of VR/AR people. It was quite high evaluation as a result. They said the both game were good ideas. Especially, they evaluated mentioning like ‘There are no feeling like why it is created for AR. They are natural as AR functions.’ I could get good motivation to continue to realize my idea. The timetable was as follows. This time, I introduce about this event itself. Next time, I would like to report on the presentations that were held there.